Each file contains 5 data sets except ETL8G_33 ([#records] = [#categories] * [#datasets], [#bytes] = [#records] * 8199). Each data set contains 956 characters written by a writer. Each writer wrote 10 sheets per data set ([#sheets] = 10 * [#data sets]). Sample Python function for retrieving a record in ETL8G (tested with Python 2.7.9 and Pillow 2.7.0). ETL-8B2 contains binalized images from ETL-8G. The threshold is determined by T=λ∙h + (1-λ)∙μ, where h is Otsu’s threshold [j] and μ is the average of all intensity levels in ETL-8G [k]. For ETL-8B2, λ=0.25 [c]. Ordered by character major. 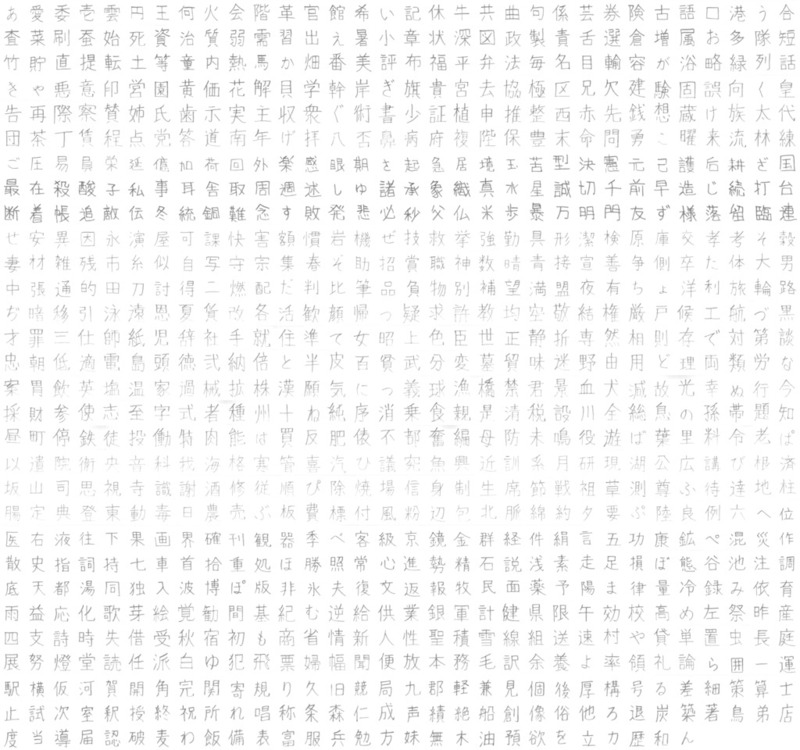 Each data set contains 956 characters written by a writer. For each character, there are 160 writers ([#records] = [#categories] * 160). The first record of each file is zero padded dummy ([#bytes] =( [#records] * 512 for ETL8B2_1 and ETL8B2_2). The last 956 records are the model images presented to writers. ETL8B2C1 26214912 1+51200 320 2122-384D The first record is zero padded dummy. Sample Python function for retrieving a record in ETL8B2 (tested with Python 2.7.9 and Pillow 2.7.0). 森俊二、山本和彦、山田博三、斉藤泰一: “手書教育漢字のデータベースについて”, 「電総研彙報」, Vol.43, Nos.11&12, pp.752–773 (1979-11&12). 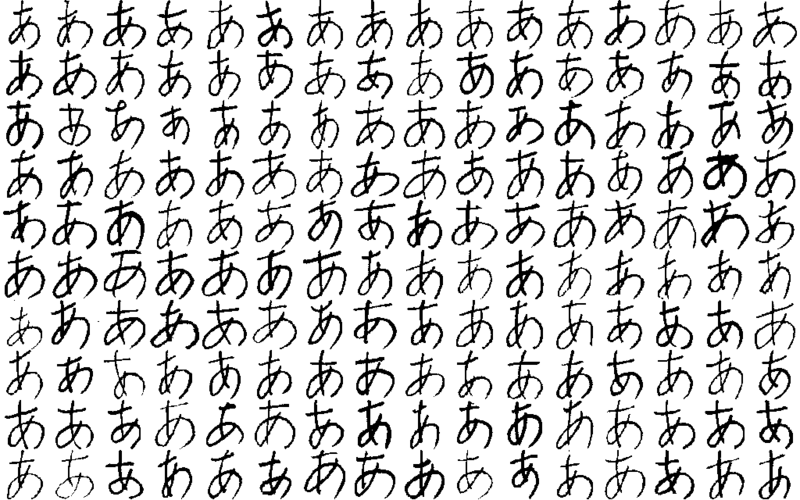 斉藤泰一、山田博三、森俊二: “手書文字データベースの解析(IV) －教育漢字の統計量－”, 「電総研彙報」, Vol.44, No.4, pp.219–251 (1980-04). 斉藤泰一、山田博三、山本和彦、森俊二: “手書文字データベースの解析(V) －教育漢字データベースのパターン・マッチング法による評価－”, 「電総研彙報」, Vol.45, Nos.1&2, pp.49–77 (1981-01&02). 斉藤泰一、山田博三、山本和彦、森俊二: “手書漢字データベースについて －教育漢字－”, 「昭和56年度電子通信学会総合全国大会(昭56信学総全大)」, 1385, p.5-363 (1981-04.03). 斉藤泰一、山田博三、山本和彦、岡隆一、安田道夫、坂倉栂子、曾根裕文: “手書教育漢字データベースの目視による調査”, 「昭和57年度電子通信学会総合全国大会(昭57信学総全大)」, 1342, p.5-327 (1982-03.28). 斉藤泰一、山田博三、山本和彦: “手書漢字の方向パターン・マッチング法による解析”, 「電子通信学会論文誌(信学論)(D)」, Vol.J65-D, No.5, pp.550–557 (1982-05). 斉藤泰一、山田博三、山本和彦: “手書文字データベースの解析(VI) －方向パターン・マッチング法による教育漢字の解析－”, 「電総研彙報」, Vol.46, No.12, pp.695–725 (1982-12). 斉藤泰一、山田博三、山本和彦: “JIS第1水準手書漢字データベースETL9とその解析”, 「信学論(D) 画像処理特集号」, Vol.J68-D, No.4, pp.757–764 (1985-04). 斉藤泰一、山田博三、山本和彦: “手書文字データベースの解析(VIII) －方向パターン・マッチング法によるJIS第1水準手書漢字データベースETL9の評価－”, 「電総研彙報」, Vol.49, No.7, pp.487–525 (1985-07). 大津展之: “判別および最小2乗規準に基づく自動しきい値選定法”, 「信学論(D)」, Vol.63-D, No.4, pp.349–356 (1980-04). 斉藤泰一、山田博三: “判別しきい値選定法の一改良”, 「情報処理学会論文誌(情処学論)」, Vol.22, No.6, pp.596–599 (1981-11).